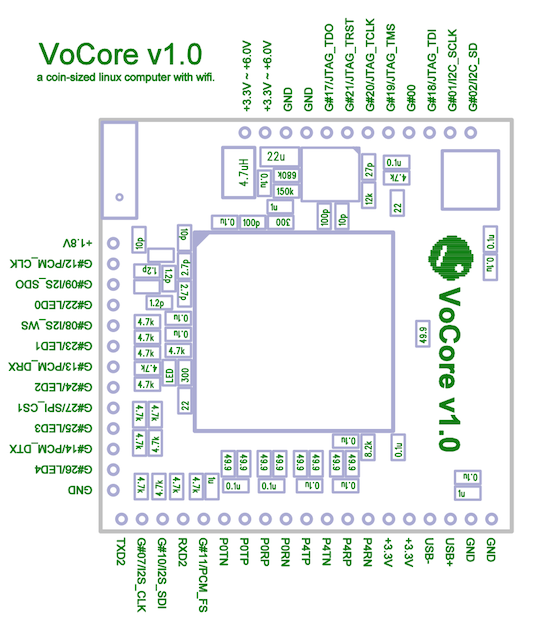 A Chinese crowd-funded effort has produced what could be – for now, at least – the smallest Linux computer-on-module so far, and with its research effort oversubscribed, says it will be shipping its “VoCore” devices by October 2014. The 25 x 25mm embedded system isn't designed for fat compute loads, but at a list price of $US20 for a basic WiFi-only system (if you need wired connections, a self-assembled dock is available for $US20, pre-assembled for $US25), the target is home automation and Internet of Things applications. Running OpenWrt on Linux, the square-inch (roughly) computer has 32 MB of SDRAM, 8 MB of FPI Flash, and a 360 MHz RT5350 MIPS processor (vendor Ralink describes the device as a router-on-a-chip). The Indiegogo page nominates applications like home robot projects, portable VPN routing, wireless speakers, Arduino control, or adding WiFi to old kit like printers and cameras that don't already have it. As LinuxGizmos.com notes, the 200-220mA power consumption will be a drawcard, and if you need Ethernet or USB, they're already on the VoCore, with only the physical interfaces to be added (via the dock).